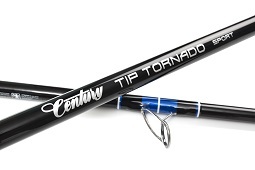 The Tip Tornado Graphex Sport takes design cues and feedback from anglers and leading casters alike with the design requirement being a rod suitable to fish both heavy and medium ground. The light weight tip is still more than powerful enough to deal with the roughest of ground. The 13’ 11” length and reduced blank diameter compared with other longer performance rods will benefit anglers who have require this style of rod design. Delivering abundant practical benefits to anglers seeking the best available to complement their dedication. Tied in metallic blue, white inlays and tippings. Jet black intermediates.